Bats can broaden and narrow their visual field by modulating the frequency of their vocalizations they use to navigate and find prey. The scientists published their findings in the journal Nature. Bats find their way through the depths of night by emitting sonar signal and using the return echoes to create a map of their surroundings. This process, called echolocation, allows them to be proficient nocturnal predators. It’s been long known that smaller bats emit higher-frequency squeaks, and it was thought that the difference arises because the smaller animals must catch smaller insects, from which low-frequency sound waves with long wavelengths do not reflect well. Annemarie Surlykke, a neurobiologist who studies bat echolocation at the University of Southern Denmark in Odense, states that smaller bats would be able to detect even the smallest prey they take with a lower frequency. So there must be another reason why there is a modulation in the squeaks of bats. 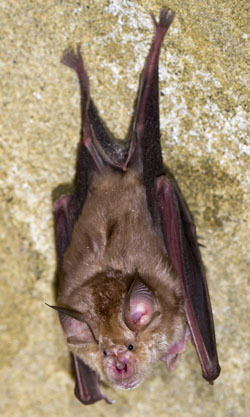 Surlykke and her team studied six related species of bats, which varied in size. The animals were captured, and released in a flight room, which was a pitch-dark netted corridor, 2.5 meters high, 4.8 meters wide and 7 meters long. It was rigged on all sides with microphones and IR cameras. The confined space should be equivalent to flying close to vegetation in the wild. The scientists measured the time it took for a bat’s echolocation signals to hit different microphones. This allowed them to measure the exact location of the animals in flight. Then, they analyzed the intensity of each signal as well as the size of their mouths to reconstruct the width of the sound beam. They discovered that the animals adjusted the frequency of their signals and the openings of their mouths to come up with the same beam width for their echolocation calls, which was about 37°, no matter their size. Small species need to use high frequencies because their mouths are smaller. A lower-frequency call would broaden the beam, making it hit more obstacles and increasing the noise of the signal. While this does bring new understanding to this field, other researchers note that “It now has to be documented for other species and for flying out in nature — in the open, in the forest, in different habitats” for the conclusion to be definitive. 2 Comments on "Bats Tune Frequency of Echolocation to Change Field Perception"
The content of the article is interesting and accurate, however the photos you used feature bats that do not utilize echolocation. Both are megabats and use their sense of sight and smell to navigate the tropics searching for fruit (not insects). Thanks for the feedback…Photos were changed.